The Unix-Haters Handbook is a semi-humorous edited compilation of messages to the Unix-Haters mailing list. The book was edited by Simson Garfinkel, Daniel Weise and Steven Strassmann and published in 1994. The book was made available to download for free in electronic format in 2003. The book concerns the frustrations of users of the Unix operating system. Many users had come from systems that they felt were far more sophisticated in computer science terms, and they were tremendously frustrated by the "worse is better" design philosophy that they felt Unix and much of its software encapsulated. The book is based on messages sent to the UNIX-HATERS mailing list between 1988 and 1993, and contains a forward by the human factors guru Don Norman and an "anti-forward" by Dennis Ritchie, one of the creators of the operating system. Many of the book's complaints about the Unix operating system are based on design decisions, such as the fact that the shell expands wildcards (which means that wildcards can only be used for filenames and not usernames, times or other things). For example, a large proportion of the complaints are about anomalies in the command line interface, and many of these complaints are still valid. But other complaints of the book have been addressed with time, such as the lack of a journaling file system and criticisms about the operating system's graphical user interface. The book predates the rise of Linux and thus concerns the several commercial versions of Unix then available (the inconsistencies between them being another major complaint in the book)—most of which have been replaced by inconsistencies between different versions of Linux and incompatibilities between various versions Linux, and between Linux and MacOS. This book was printed as a trade paperback. Its front cover was designed to be similar to The Scream. An air sickness bag, printed with the phrase "UNIX barf bag", was inserted into the inside back cover of every copy by the publisher. The front-matter page's dedication says: "To Ken and Dennis, without whom this book would not have been possible." These are references to Ken Thompson and Dennis Ritchie, the creators of Unix. 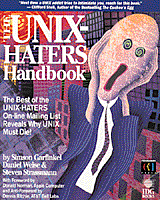 ^ ""The Unix-Haters Handbook" WWW Page". 2004-11-05. Retrieved 2008-03-17. Kuchling, Andrew (October 1997). "Review: The Unix-Hater's Handbook". Linux Gazette (22). Raymond, Eric S. (September 30, 2008). "The Unix Hater's Handbook, Reconsidered". Armed and Dangerous. Retrieved 2011-06-07. This page was last edited on 21 December 2018, at 13:14 (UTC).